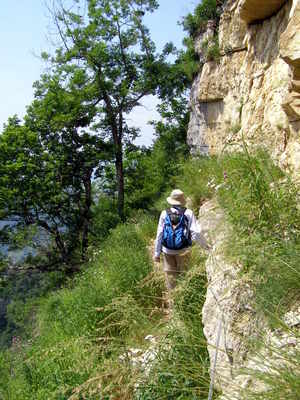 Although the summit of la Grande Sure could be reached on this walk, there are better ways of getting to the top and this walk is satisfying in its own right without the necessity of having such a prominent objective. It explores two fine routes into the massif, and is guaranteed to please. It ascends into the massif via la Pas de l'Aronde to reach the col d'Hurtières, and returns via the Pas de Miséricorde (map). We need to backtrack along the track which we have just driven, and turn left at the first junction towards the small community of les Reynauds which is reached after quarter of an hour. Despite being on the road, this introductory section of the walk is surprisingly pleasant. Normally, walks in Chartreuse start with a vicious climb, but this time muscles are allowed to warm up, and there are fine views across the hay fields to the softer hills of the western part of the massif. Once past les Reynaud the road becomes a track, passes below a hay field, and gently descends round the head of a small valley before ascending steeply to a signpost at Cotta Bois (825 m), where we are directed to go straight ahead. Two minutes later the way divides and our route is up the steeply ascending track to the left. This soon develops into a pleasant forest path which after a further half an hour reaches some cliffs which it meanders up through weaknesses and along narrow ledges. This is the Pas d'Aronde, and is wonderful walking, although a little exposed in places (Difficulty 2). We once found a fossil ammonite embedded in a limestone pebble on this section. Towards the top it ascends steeply up a scree slope towards a gully, which is a little wearing. The end of the steep section of the pas d'Aronde is marked by a signpost pointing to a belvédère, reached some 45 minutes after starting our ascent through the forest. Note that the position of this belvédère seems to be misplaced on the IGN map.The views from here are spectacular with les Reynauds directly below, and the plains disappearing into the distance towards Lyon. In the foreground one can see across the Trois Fontaines cirque to a similar belvédère which we will visit on our descent. From the belvédère the way ascends easily through the forest on a subsidiary ridge, before turning east onto a major ridge. This section is level and a little muddy in places, but passes through some exquisite orchid glades before emerging on to the Prairie de Charminelle - an abandoned pasture. The problem with such places is that they get overgrown - to the extent that identifying the path can become a problem. Fortunately, 2.5 m high marker posts have been emplaced which makes route finding a little easier, but you will still get ambushed by the occasional nettle and bramble. On the plus side, the flora and insect life are a joy. After a few minutes of fighting the rampant vegetation, we reach a sign-posted junction marked as Charminelle (1505 m), with paths going off on either side of the ridge, and ours going straight on. Our next target is to get through the crest looming above, and although it looks a steep, formidable proposition, the way up the grass slopes is surprisingly easy and not nearly so far as it looks. It is, moreover, one of those floral wonderlands where every step is a delight. Once the cliffs are reached, the path ascends through a chimney where some use of hands is required, to emerge on the crest (1790 m) an hour after leaving the junction below. This is an excellent place for lunch which allows the new vista that has been opened up to be enjoyed to the full. Before us are the pastures of the internal valley of la Grande Sure, and behind them Chamechaude, Charmant Som, and Dent de Crolles can be seen in all their glory. It is now down hill all the way back to the car. Following the fence reaches a junction at the col d'Hurtières, where we turn left. The paths in this area have been well ploughed up by the many herds of docile cattle, and the precise line underfoot is not always clear. However, the general direction is to make your way down to the refuge d'Hurtières in the valley floor, and then follow the valley down to the end of the southern ridge of la Grande Sure. Eventually, you will arrive at la Velouse (1500 m) - one of the main access routes into the valley. Turning left through the fence leads onto a steeply descending stony track which eases after some ten minutes. Fifteen easy minutes later, having passed a junction to the left which leads back to Charminelle, the views start to open up and the path morphs into the Pas de Miséricorde - one of the highlights of the day. This superbly made section of path follows a ledge system through the cliffs, and although there is some mild exposure (Difficulty 2), the path is so well made there is no objective danger, and it is equipped with a cable to reassure the nervous. It's airy, and great fun. A few minutes later a belvédère is reached which we had looked across at on the way up. This has a fine view across the cirque to a small thrust fault - it's a good place to sit and enjoy the view. Following the path down, the car park will be reached within another 35 minutes.